Since I published the original RGB LED driver (photo right) I’ve had many enquiries from people asking how they could make the original board work with more LEDs. I’d already made a couple of custom boards up for myself, so I finally decided it was time to put together one for the website. Here’s a one off light bar I built using 20 Piranha RGB LEDs and the (prototype) MOSFET driver board. Assembled into a 25mm x 50mm x 1000mm aluminium ‘U’ section. This was fitted under a wall shelf to illuminate the floor. It’s very bright and gives a nice even illumination without any additional diffuser. The input power to the board must be regulated DC and be capable of suppling the power requirements of the output load. 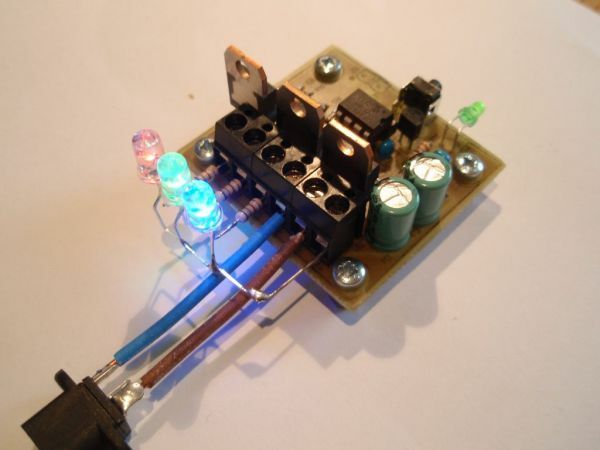 The circuit will operate from a supply voltage in the range 9 to 24 volts. This voltage range is dictated by the input requirements of the 78L05 voltage regulator and capacitors C3/4. Switch S2 is not used with the firmware on this website and you do not need to fit it. I’ve incorporated it the PCB design because I’ve written some customized versions of the code that did require two switches. During testing I connected the controller to some 50W / 12Volt halogen downlight bulbs, one on each channel then ran them at 100% PWM duty cycle. Based on these measurements and the specification of the MOSFETs and PCB connectors, the controller should comfortably handle 5 amps per channel. While the individual MOSFETs could handle more current, the PCB screw terminal connectors are rated at 16 amps and since there is only a single Ground connection to the board, total load for the three RGB channels should not exceed this. You can buy all the parts needed to build this project from most component suppliers world wide. In the UK you can get everything from Rapid Online and I’ve included a parts list with their part numbers below. Have you ever seen a fan resistant to dust and water?